"Are you joking??" asked a woman in line after a staff member told her about the night's coming performance. She clearly hadn't read or heard about Sleep and if you come unprepared, it would be a bit of a shock to find out what's in store. But it's no joke. 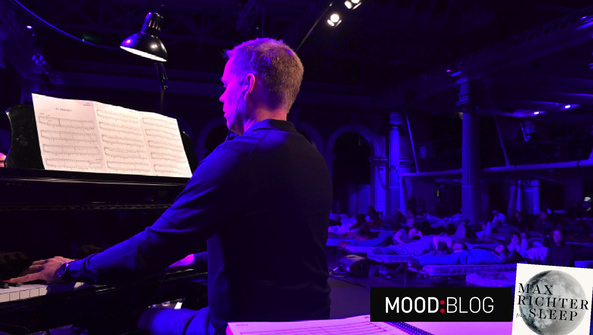 Sleep is eight hours of non-stop music, performed live overnight, and, yes, there are beds. To call it a concert does not seem accurate. Sleep is an experience. It isn't surprising that the woman in line was unfamiliar with Max Richter's enormous work. Prior to this event, Sleep had only been performed in Sydney, Paris, London, and Berlin. This performance at South by Southwest (SXSW) marked the North American debut of the monumental Sleep. With Richter himself on piano, keyboards, and electronics, soprano Grace Davidson lending wordless vocals, and members of the American Contemporary Music Ensemble on violin, viola, and cello, those brave (or un-informed) enough to venture out for this marathon concert were in for an unforgettable night.